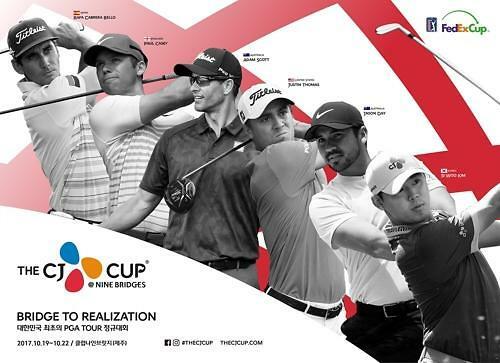 Top players such as Adam Scott, Jason Day and Justin Thomas will compete in South Korea's first PGA event, "The CJ CUP", in October, organizers said amid concerns about high regional tensions caused by North Korea's missile and nuclear threats. The 78-player tournament, sponsored by South Korea's CJ Group as part of the 2017-2018 PGA Tour season, will be held at Nine Bridges Golf Club on the southern resort island of Jeju for four days from October 19. The prize money stands at a total of 9.25 million US dollars, one of PGA's largest. "PGA players, Justin Thomas, Kim Siwoo, Jason Day and Adam Scott, have decided to play in the October golf event," CJ said in a statement on Thursday. CJ said it would invite other top players to host Asia's largest PGA event. However, concerns are growing among those who promised to attend the CJ tournament due to heightened military tensions on the Korean peninsula following North Korea's sixth nuclear test on September 9. Golf Channel reported that PGA Tour is closely monitoring political developments around the peninsula as well as "the top 60 available players off this season’s FedExCup points list". The Tour plans to "issue a security and safety guidelines document" to players, it said. The Tour plans to "issue a security and safety guidelines document" to players, it said in a statement. "From a safety and security point of view, we will continually monitor, review and evaluate the situation. Should future circumstances or developments dictate a change in our position, we will promptly advise all parties accordingly." "I'm planning to play," Lucas Glover, the 2009 US Open winner, said. "I have concerns. I sure hope the Tour is on top of it, which I’m sure they are. We can’t send a bunch of guys over there with worldwide turmoil."